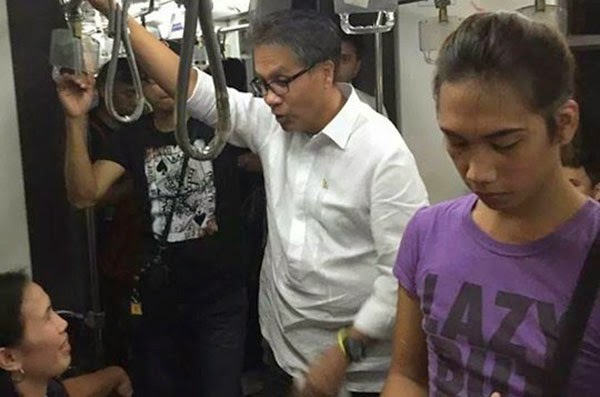 A photo of interior secretary Mar Roxas riding the Metro Rail Transit (MRT) last Friday, November 28, 2014, is making rounds on Facebook. Post by Oras Na, Roxas Na. A commuter took a picture of Sec. Mar Roxas who rode the MRT yesterday to avoid the usual Friday pay day traffic jam. This was between Buendia station and Quezon ave. This is the humble and modest trait of Mar Roxas. Kung ibang na sa mataas na posisyon sa gobyerno yan, malamang ay ginamit na nila ang kanilang impluwensiya at koneksyon para makarating ng mabilis sa kanilang pupuntahan. Yan si Mar. Hindi gumagamit ng police escorts. Hindi nangbu-bully ng kapwa motorista. HIndi utak wang-wang. Ang karapat-dapat na sumunod na presidente ng Pilipinas. Some netizens and bloggers asked if the person who took the photo of the cabinet member riding the MRT train was really a commuter. Many suspect that the picture was just snapped by one of his aides and uploaded it in the internet as part of his political propaganda. Mar Roxas is said to be running for president in the 2016 elections.